Another top quality 4 ½" tube system, the Hamilton Air HA-45 is an overhead system that is designed to easily transport typical banking, weigh station documents, manufacturing and warehouse paperwork and retail pharmacy and healthcare transactions. Hamilton Air’s superb 5500 Series full duplex digital Audio System ensures clear communications with the HA-45. We also offer optional one-way and two-way LCD video systems along with hands-free wireless headsets. The HA-45 comes with our standard overhead teller terminals, but other options are available including thru-the-counter, double-sided and motorized units. Special Pricing on installtion and retrofit construction projects. • Maximum teller space. The low-profile teller terminals allow for unsurpassed line-of-sight visibility. • Simple installation. Only a single tube is needed to connect the HA-45 to a teller station. • Exclusive turbine system. The super-reliable and patented PowerStar turbine system provides maximum load-carrying capacity with lower operating costs. • Easy to service. Components are easy to replace if they become worn or damaged, so there’s no delay in keeping your unit operational. Customers enjoy clear and comfortable communications when Hamilton Audio and Video consoles are combined. The full-duplex audio system can serve up to 12 remote locations while a bright 10”LCD display helps make the transaction personal and direct. Large 10” LCD display along with wide dynamic color camera delivers crisp clear video communication. A high-intensity sun viewable option is also available. The HA-45 air tube system upsend customer unit is less than 11 inches wide and 10 inches deep allowing it to fit on smaller islands and tight places. In addition, the service access is from the front of the unit, so the HA-45 can be placed against a building or structure. Ideal for new construction and replacement projects. Super reliable engineering combined with all weather stainless steel exterior makes the HA-45 low maintenance and easy to service. 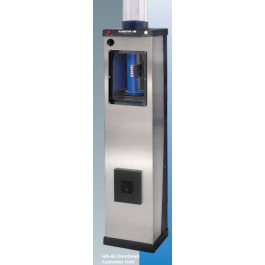 The HA-45 systems include our patented PowerStar Air Turbine unit located inside each customer terminal unit. Installation is simple as there are no blower packs to be installed in the canopy or remote location. However, if remote mounted turbine units are desired, the Hamilton Air HA-50 systems offer all the same functions, reliability and styling with the Air Turbine unit remotely mounted.